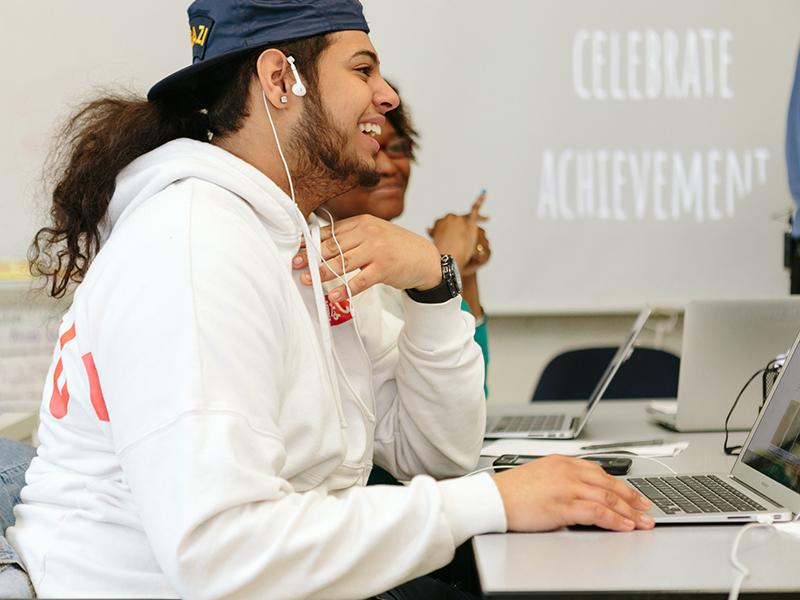 Creating a “Culture of Revision” is key to learning at Bronx Arena. In traditional classrooms, many times grades are binary (pass or fail based on a rubric) without giving students opportunities for incremental growth within a skill area. Bronx Arena wanted to move away from this model, but also make sure the culture of revision didn’t mean having a student revise the same essay over and over. To address this, they use a specific protocol where students identify skills and/or sub skills within a task they are working on and the teacher gives specific feedback on their progression towards that skill (e.g. a strong writer may choose to focus on becoming more nuanced; while a student who is struggling in math may choose to focus on content knowledge). Once the revision is turned in, the student gets credit for their work on the revision as well as the task. This structure also helps the school strike more of a balance between formative and summative data and feedback. Under earlier approaches, feedback was provided after longer time periods and students handed in more work. The updated revision model provides feedback after each work component. This allows for more relevant feedback, stronger personalization, and timely interventions. Identifies skill and sub skills they are focusing on within the task. Applies feedback to their revision of the task. Works through competencies until they demonstrate mastery. Provides meaningful feedback to ensure students know specific areas to focus on. Gives credit to students for revisions and completing assignments. Reflects on the amount of revisions needed for learning tasks and adjusts the task if needed (e.g if everyone who takes this course needs a revision of the task, then either the task is poorly written or scaffolding needs to be improved). Tracks revisions, skills, and sub skills students are working on.